The inhabitants of Nazlet El-Samman live at the foot of the pyramids of Giza. They have a long history of service to tourists and they desire to continue to ply their trade. 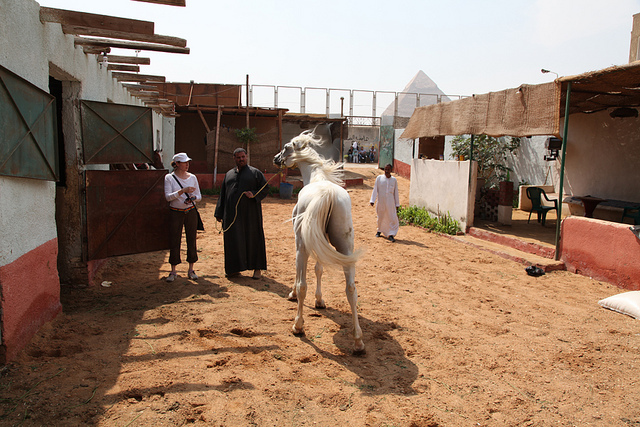 “A man called El-Hefnawi was once famous for being able to climb the great pyramid in seven minutes, and a cameleer called Lamea owned a camel of worldwide fame; it was called Canada Dry and people came from far and wide to ride it,” said Zahi Hawwas, director of antiquities of the Giza Plateau (the then minister of antiquities in the last cabinet in Mubarak’s era and also in the first cabinet after the revolution). 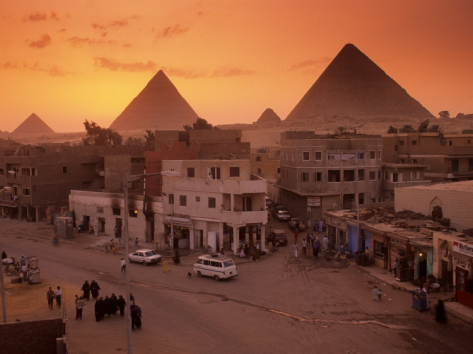 Such stories are also told by members of the community situated beside one of the most famous sites in the world, the pyramids of Giza. The settlement was named after Sheikh Hamad El-Samman who settled there in the 7th century; he devoted himself to worship in one of the ancient Egyptian tombs on the necropolis belonging to an official called Debhen who lived in the time of Menakaure, builder of the second pyramid. Today the settlement has expanded and some 70,000 people live in Nazlet El-Samman. 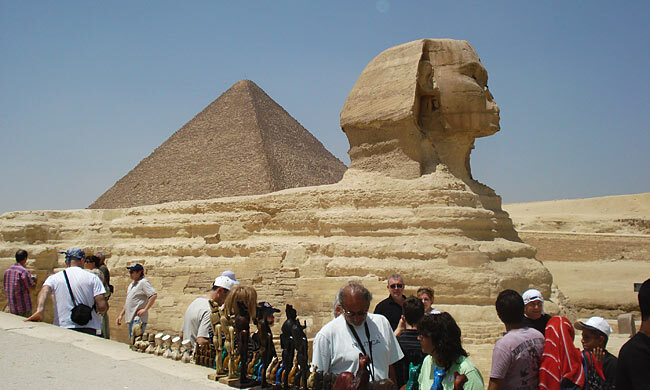 They are the people who serve an estimated 3,000 tourists who visit Giza daily in the peak season. They own the horse stables, they are the cameleers, and they are the traders who own numerous papyrus galleries, oriental bazaars, and kiosks that sell “instant antiquities” in the area. In Nazlet El-Samman there are about 100 shops and papyrus galleries, as well as about three times as many carpet shops as there are at Sakkara. The traders do a thriving business on cleverly manufactured fake statuettes, and a large variety of gold and silver jewellery is also on sale. In Nazlet El-Samman, the tribal identity is strong. The inhabitants are of Arab stock; that is to say they are desert people, not Nile Valley dwellers, and they first came to the area in large numbers when the Mena House Hotel was built around the turn of the century. The area is characterized with large families which are closely attached to each other; there are clans that go by such names as Khattab, El-Gabri, El-Shaar, Fayed, El-Komati, Abu- Ghounan, Abu – Ghanem and Abu Talib. Members of each clan tend to intermarry and weddings are a great celebration, when animals are slaughtered for a great feast, drums like the tabla baladi announce the happiness of the families, and horse dancing is part of the festivity. Foreign visitors are always welcome at such occasions. Collective marriages are performed on that day, in the belief that the couples are especially blessed by the holy sheikh. “More than a hundred wedding parties are not unusual,” explained Atef El-Gabri. And just as tourists are welcome to watch or participate in wedding receptions at hotels in Cairo, and share in the happiness of the betrothed, so too are they welcomed at Nazlet El-Samman. The people do not see themselves as obstacles to archaeological excavation and the protection of the monuments. “If a mummy is found under one of our houses the government can remove it, but there is no need to remove all the houses! is their attitude. In fact, they are right. The government has decided that houses falling into disrepair will not be rebuilt; instead, their residents will be provided with new accommodation elsewhere. Meanwhile, the shops, stables and cameleers will remain. 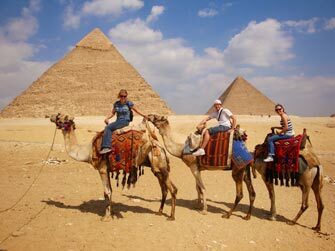 Tourists to Giza will continue to be enticed by established customs, and to enjoy the services of the people.